Located on the northern tip of Marshall's campus is Joan C. Edwards Stadium. The 38,016 seat stadium replaced an off campus facility, Fairfield Stadium. The stadium made it's debut in 1991. The stadium is one of two that is named after a woman in FBS football. The outside of the stadium at the main entrance, to the left, is a memorial to the 1970 plane crash victims. 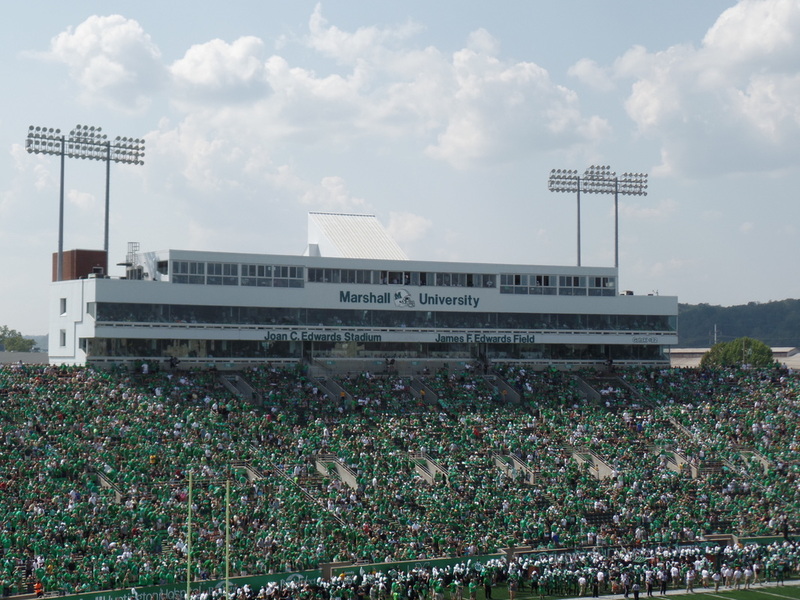 In the center of the brick structure are James F. Edwards Field, Joan C. Edwards Stadium, Marshall University and the Marshall Logo at the top. As you walk around the stadium you see brick walls separating you from the sidewalk to the stadium with gate numbers on them. Several banners of former players can be seen around the stadium as well. The basic structure of the stadium is in the shape of a U. On the west side of the stadium they have the press box which houses 20 indoor sky suites. On the press box they have the name of the field, stadium, and Marshall University with a Marshall football helmet in between the words at the top. To the far right of the press box is a retired number, 72, which belongs to Frank Gatski. The seating on the west side includes 4,332 green chairback seats that sit in the middle of the west side of the stadium from sections 108-118. The south side of the stadium houses the MU Band in the lower level next to sections 128 and 130. 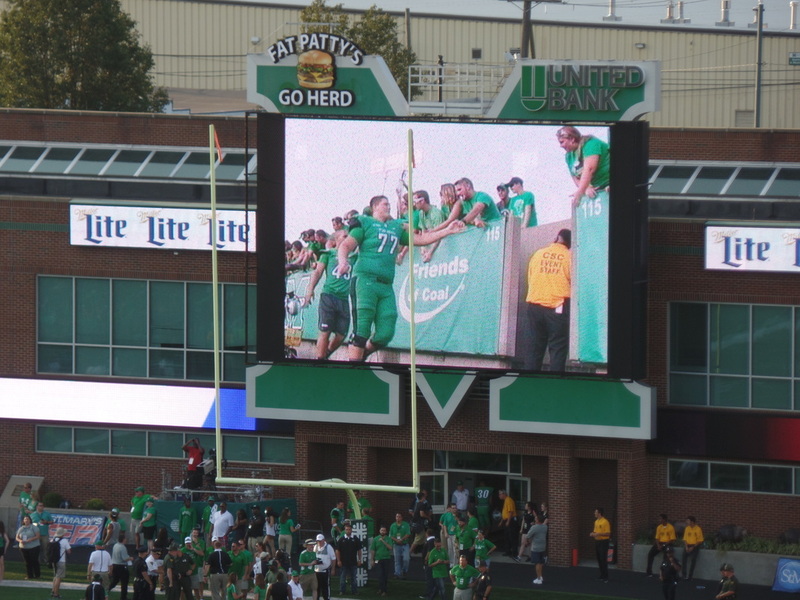 In front of the lower level seating is a brim that has the Words Thundering Herd written on it and hedges at the top. In the upper levels are green bleachers that are for general admission seating. The larger scoreboard is located at the top of the general admissions seats. 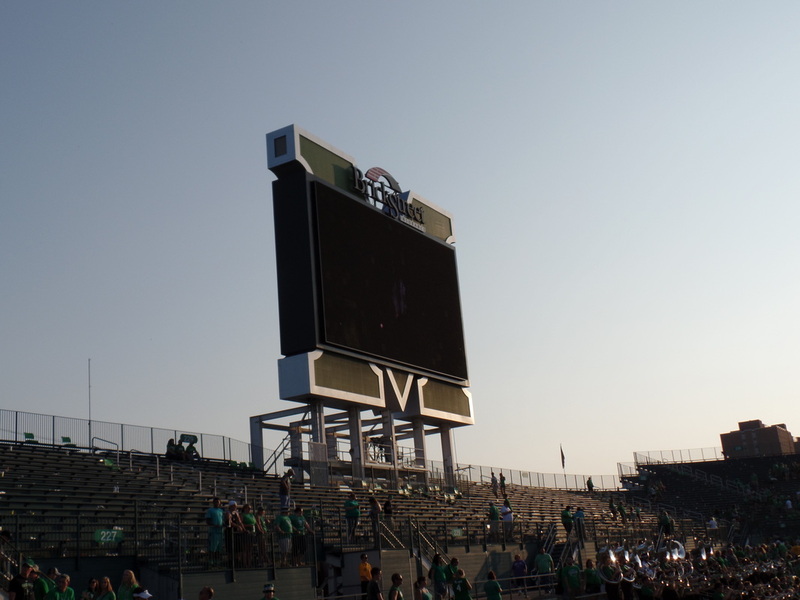 The video board is on a large green Marshall M. Some of the Marshall student seating is in the south side of the stadium but the primary section for students is on the west side. Here on the East side you will see the passionate Herd student section from 115-119. The visiting team is located at the far end in sections 101-103. In between are silver colored bleacher seating. The north side of the stadium is the where the smaller scoreboard is located. It has a similar design to the one in the south end zone. Behind the scoreboard is the Shewey Athletic Center which holds the locker rooms, meeting rooms and offices. The concourse holds your typical concession stand options and restrooms. Throughout the concourse you will see banners of former players. #1 First stop on the trip has to be to Spring Hill Cemetery where you will find a Memorial to the 1970 Marshall football team. 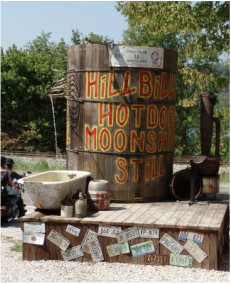 #2 Next you'll head north to Hillbilly Hot Dogs. More on them later! 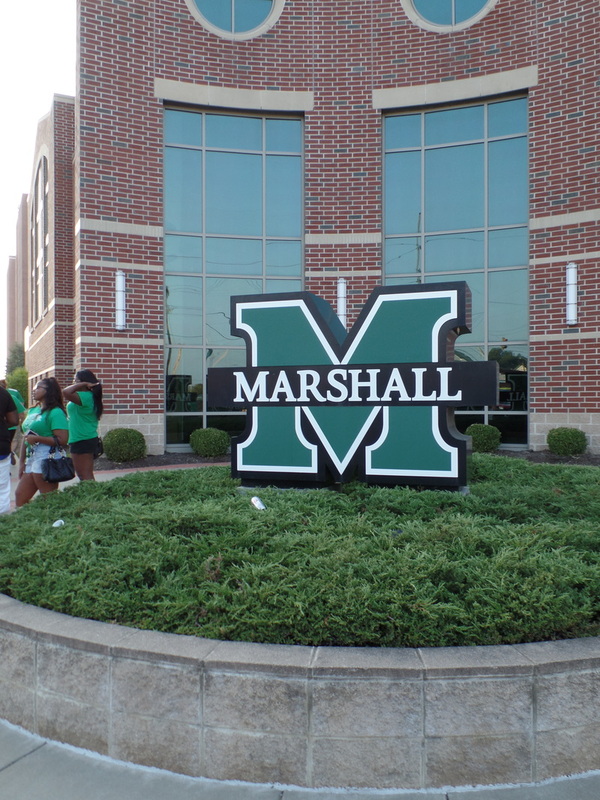 #3 Head back and take a walk on the Marshall campus! Don't miss the memorial by the Student Center or the John Marshall statue. 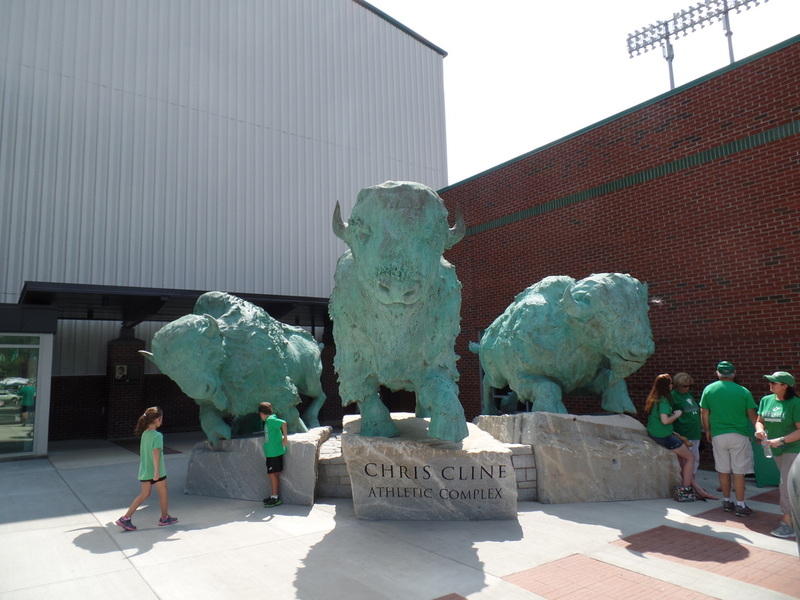 #4 Head over to the practice facility and check out the Marshall Sports Hall of Fame and the giant buffaloes statues. #5 Head to "The Joan"! Joan C. Edwards Stadium: The location of the stadium is great with it being on campus. Not a bad seat in the house and for the most part good sight lines. Having some chairback seats and suites is always something I like to see in a college stadium. The brim in the south end zone are great it provides a great look with the scoreboard and hedges in the background. On the downside there were few things that stood out to me. The concourse is a big negative. It is too tight, feels dated. The south end zone with the rocks seems like a horrible idea all around. The stadium as whole needs a bit of a face lift, give it a more modern feel. Upgrades: The size of the stadium doesn't bother me too much 45 to 48 thousand is about as big as I would go. Where I would add the seats is the east side of the stadium and add another level, concourse. The north end zone could be utilized better as well. Above the Shewey Atheltic Center, a recruiting room could be used to host recruits. The concourse needs the most work. It wouldn't be too difficult to widen the east and west side of the stadium. You could then add concessions on both sides. As for the rocks under the south end zone. Several options here but one that could be beneficial are a women and mens bathroom and two pop up concessions. If that route is not feasible why not put some tradition and history there. Add in a few statues of Herd football greats! Call it statue row. 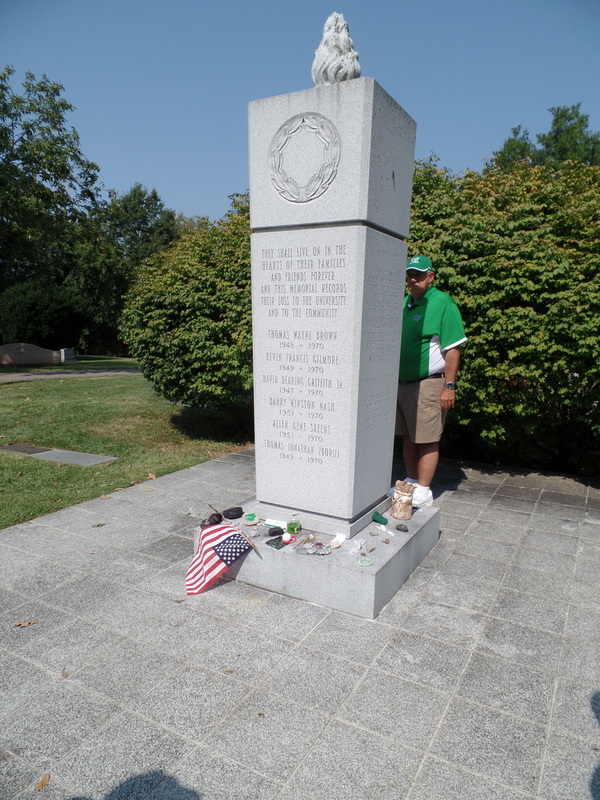 Marshall has an amazing history and the more you promote it the better. Anything will be better than the rocks. 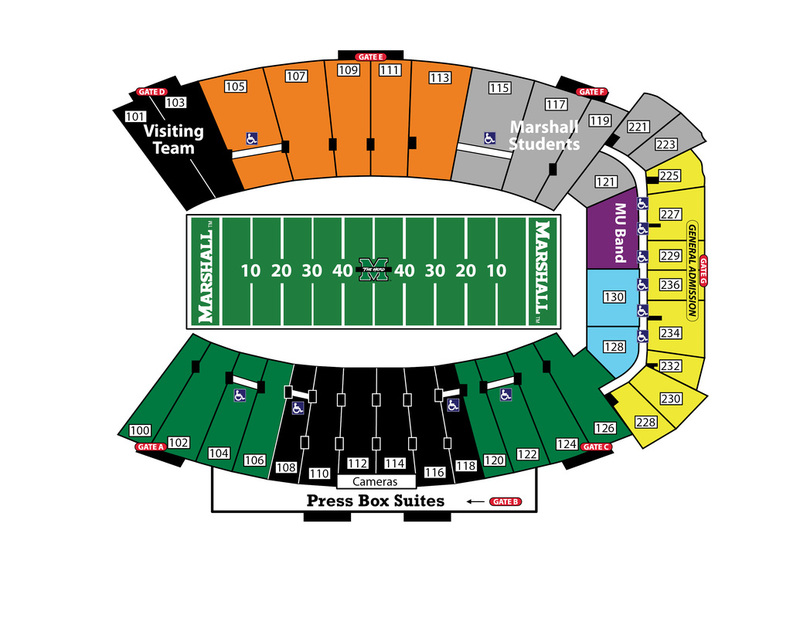 One change that would take the Marshall atmosphere to another level would be to add some over hang to the whole stadium. (Here's some examples Baylor, Washington) Chairbacks in every section but general admission would take the stadium to another level. Many stadiums just have bleachers, to be at the forefront of changing that would be big. So after all my fixes and changes and negatives that I pointed out you may think that I wouldn't recommend people to go to Marshall for a game, that would be wrong. If you are college football fan, this is a must visit, the history here is one of many reasons to come here, but the experience as a whole is awesome. 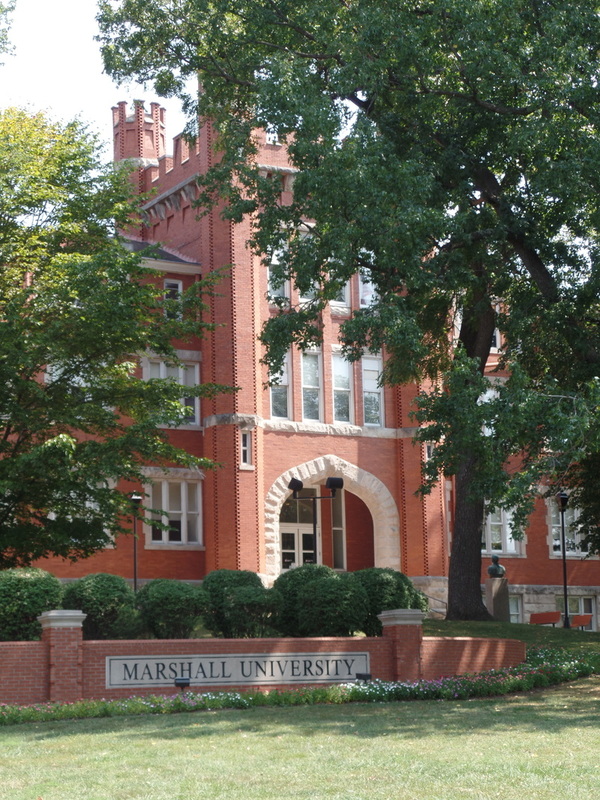 Marshall Campus: Marshall University located in Huntington, West Virginia is named after John Marshall the fourth Chief Justice of the United States. Marshall was Chief Justice for six presidents. 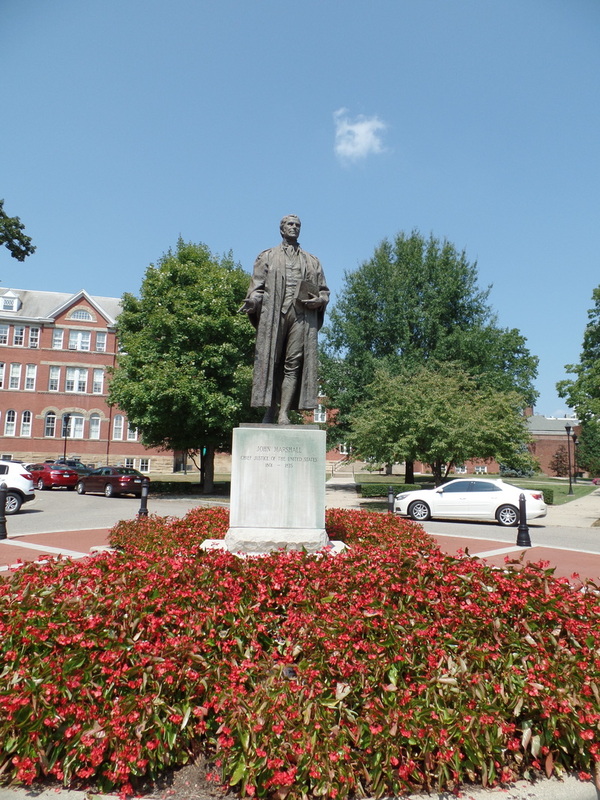 You can see his statue near the Old Main building which is located on 16th street. Old Main is my favorite building on campus, it is the oldest building and the towers really stand out. As you pass the John Marshall statue and head straight ahead you will see the student center and the Memorial on the Student Center Plaza. 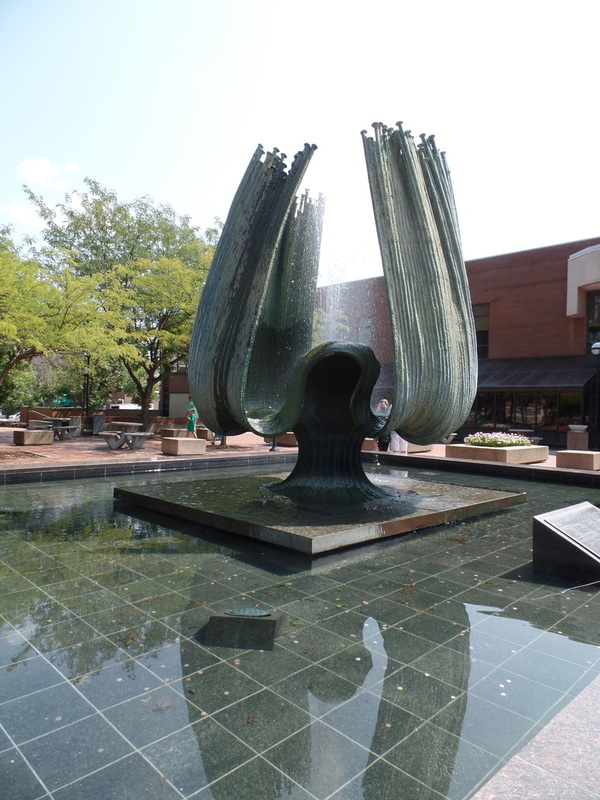 The fountain is the centerpiece of the plaza and at the top of the memorial is 75 points which represent the 75 lives lost in the 1970 plane crash. As you continue your walk to the stadium you will pass Cam Henderson Center, home of the basketball team and Rec Center. If you go past the stadium you will see the indoor practice facility which is really awesome to have. They have added three huge statues of buffaloes which can be seen in front of the Hall of Fame. The Hall of Fame is very clean and sleek. 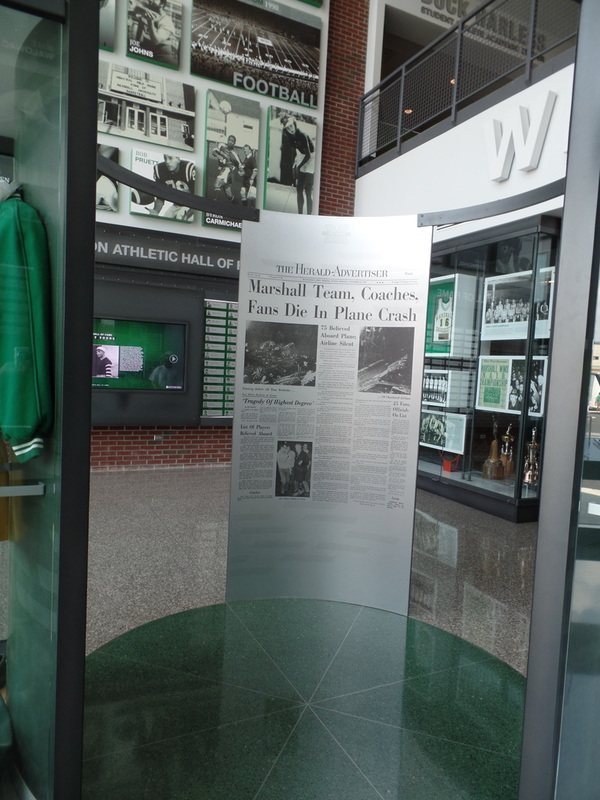 They have pieces on familiar Herd favorites such as Randy Moss, Chad Pennington and Byron Leftwich. On the out skirts of the main drag of the campus are a lot of new buildings more specifically on the east side of 5th Avenue. 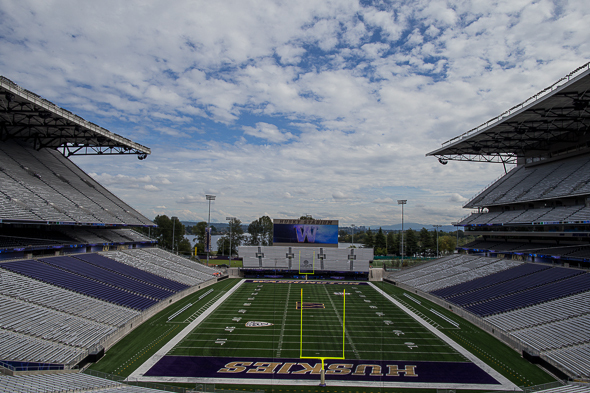 Scoreboard: The stadium houses two scoreboards, one in each end zone. The one in the scoreboard in the North end zone is the smaller of the two. It has the Marshall "M" behind the scoreboard which is a nice look. The same goes for the one in the south end zone. While we all prefer to see a scoreboard with no advertisements it is obvious why they do have it, to make money. It is always nice for a stadium to feature a scoreboard on both ends for the fans who have to sit under or to the side of a lone scoreboard. Some LED ribbon scoreboards would be a great addition to the stadium. 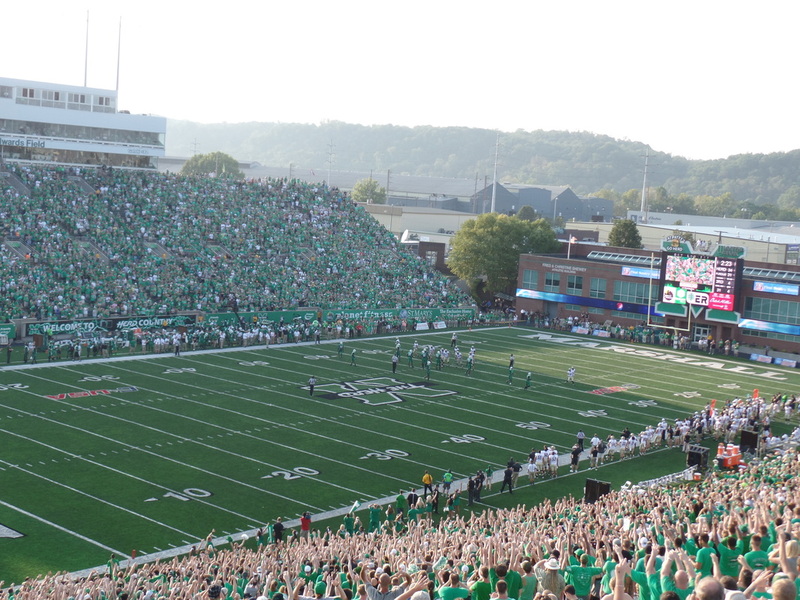 Atmosphere: Here's where Marshall fans came through big time. The campus was full of green and the tailgates were out in full force. The stadium had it's third largest attendance in history while I was there. The student section was packed which is always a big plus. 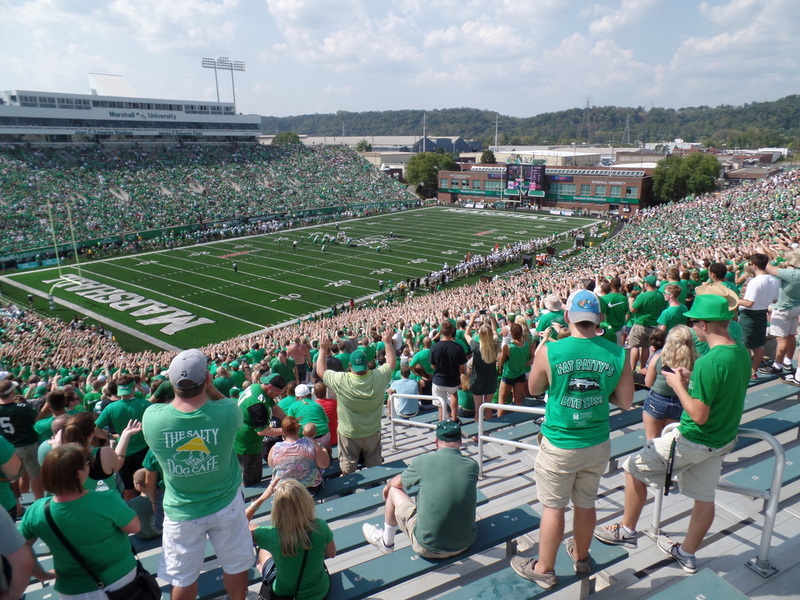 Hearing WE ARE.....MARSHALL in the fourth quarter was electric! Love the students on third down with their hands up. Overall Marshall fans were great on my visit! Huntington, West Virginia: Huntington is the second largest city in the state of West Virginia. It lies on the banks of the Ohio river and the Guyandotte River feeds into the Ohio. The city has the largest inland river port in the United States. It also has a lot of train traffic with CSX. One of the big efforts to spruce up the downtown area is Pullman Square. The square is home to several shops and popular dining options. Near the Square the city has poured money into ninth street and "The Old Main Corridor" on 4th street. Huntington is big on hot dogs, they hold a hot dog festival the last weekend of July. I got the chance to try a local hot dog at Hillbilly Hot Dogs. The decor certainly fits the name when you arrive you'll see all kinds of awesome junk! If you are able to eat in one of the school buses like I did, do it. One of the new attractions coming to Hillbilly Land is a Weddin' Chapel! Yes, you can get married here. As for the food fare, I went with the "Whazzz Up" Dog and the Taco Dog. Both were amazing but I favored the "Whazzz Up" Dog. If you are up for a challenge take on the Homewrecker. The 15 inch hot dog has all the fixins', good luck. Be sure to leave a tip and you'll get to hear the song! They do attract a line so get there early. Other hot dog establishments that were recommended to me are Stewart's Original Hot Dogs, Sam's Hot Dogs and Frostop Drive-In. If hot dogs aren't your thing many fans recommend Fat Patty's, Hall Of Fame Cafe and Jewel City Seafood Market. If you are looking for things to do around town, two places that came under recommendation to me were Ritter Park and Huntington Museum of Art. On my visit I was able to go to Spring Hill Cemetery to see the Memorial that is dedicated to the 75 victims of the 1970 plane crash. This is a must see on your visit.